Facebook founder and CEO Mark Zuckerberg married Priscilla Chan on May 19th 2012, two days after the social networking site had the biggest tech IPO in history and five days after the bride graduated from medical school. The wedding feast came from the couple’s favorite Palo Alto restaurants, Palo Alto Sol and Fuki Sushi, and for desert they had Burdick Chocolate “mice,” which Chan and Zuckerberg had on their first date. Chan also updated her Facebook page. 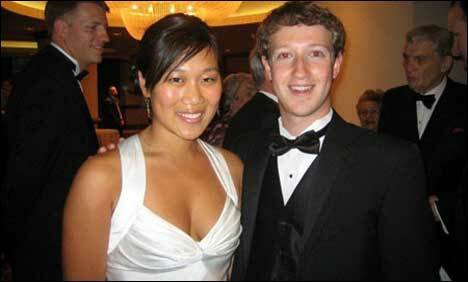 "Married Mark Zuckerberg," she wrote. Zuckerberg's status update had almost 140,000 likes as of 6:50pm local time, (11.50am AEST). "That's awesome! Congratulations!! Beautiful couple!" one well-wisher wrote. "Congrats Mark, You have been having a good week!!!!" another said, referring to Facebook going public Friday. Zuckerberg took his company public in one of the most anticipated stock offerings in Wall Street history Friday. And Chan graduated from medical school at the University of California, San Francisco, on Monday, the same day Zuckerberg turned 28.